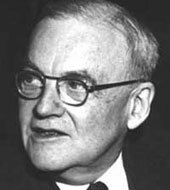 John Foster Dulles was appointed Secretary of State by President Dwight Eisenhower on January 21, 1953. Dulles served for much of the decade, leaving an indelible mark upon U.S. foreign policy that included close cooperation between the Department of State and the Central Intelligence Agency as well as a focus upon international mutual security agreements designed to contain communism. Dulles was born in Washington, D.C. on February 25, 1888. A grandson of former Secretary of State John Watson Foster and the nephew of Woodrow Wilson’s Secretary of State Robert Lansing. Dulles was surrounded by members of the foreign affairs community from an early age. During his adolescence, he spent a year in Paris before attending Princeton University. Dulles returned to Paris in 1919 to attend the Paris Peace Conference of 1919 as part of Bernard Baruch’s Reparations Commission and Economic Council. During this time, Dulles formed strong opinions about the danger of holding Germany responsible for war reparations and—from the failure of President Woodrow Wilson to gain U.S. support for the League of Nations—the value of maintaining strong domestic support for U.S. foreign policy. During World War II, Dulles served on the War Trade Board as a lawyer. After the war, Dulles entered private practice and in 1949 was appointed to the Senate by New York Governor Thomas E. Dewey, although he failed to win reelection. President Dwight D. Eisenhower appointed Dulles as his Secretary of State on January 21, 1953. During the 1950s, Dulles and Eisenhower forged a strong friendship that granted the Secretary of State direct and unprecedented access to the President. Furthermore, Dulles’s time as Secretary was marked by a general consensus in U.S. policy that peace could be maintained through the containment of communism. This consensus allowed Dulles and Eisenhower to secure international mutual security agreements while at the same time reducing the number of troops in the U.S. military and the production of conventional weapons. Dulles also enjoyed the close cooperation of the Central Intelligence Agency, which was run by his brother, Allen Dulles. Dulles was also the first Secretary of State to be directly accessible to the media and to hold the first Department press conferences. Poor health forced Dulles to resign his position at the Department of State in April of 1959, only weeks before his death on May 24, 1959.